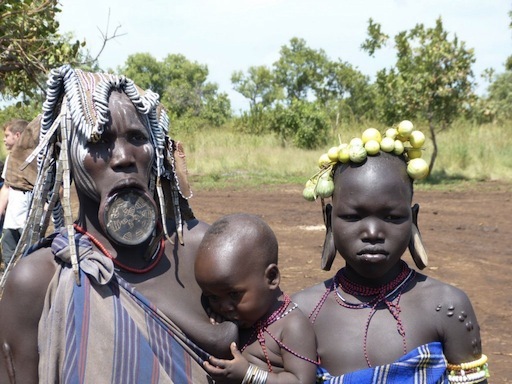 The famous « lip plat » women are found in the Suri culture (Mursi and Surma), women wear very large pottery plates in their lower lips (removing the lower teeth aswell and cutting a part of their lower lip) . It’s a sign of great beauty, the bigger the plate the better looking is the woman, it is also worn by unmarried young ladies. It can sometimes be a sign of wealth, the size of the plate is based on the number of cattle given for the bride’s price. You will also see smaller or larger pottery plates used as earings by both men and women, at a very young age aswell. The plates are made out of wood, sugar cane for the ears or in clay. Every women craft their own plate and design them.